Edinburgh Yarnfest 2018 : 3 questions to the women behind EYF! It was a bit quiet here lately. The people who follow me on Instagram might know the reason. I started a new 9 to 5 job in December after a long creative sabbatical. And of course, there is a bit of adjustment and adaption necessary. Anyway, I am still knitting and I am still curious, so I will keep writing this blog that I started a year ago. One of my first posts last year was about my visit to Edinburgh Yarnfest in March 2017. 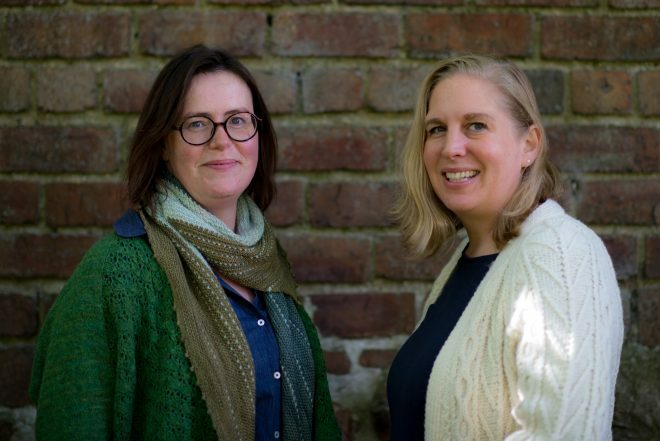 So when I decided to visit again this year I asked Mica & Jo, the two women to whom we owe EYF if they could answer me three questions about our favourite knitting festival. The first EYF took place in a small drill hall in Leith in 2013 and around 1.500 knitters came. Which, according to Mica and Jo was much to their surprise. If you are interested what it then looked like, you might want to watch this video. It was filmed by a couple film students from Edinburgh. It was a much smaller event then, you are able to see why it is so successful. It is just wonderful. 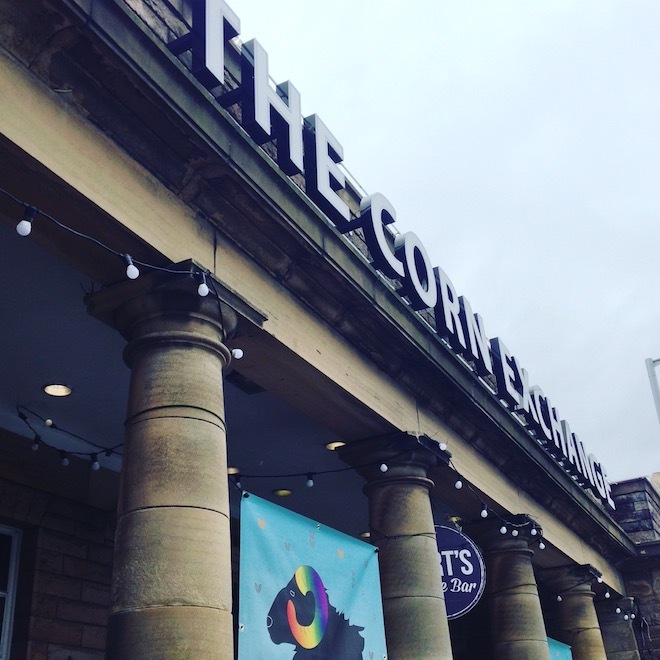 Last year 5.000 visitors came to EYF at the Corn Exchange. This year Edinburgh Yarnfest will be held from March 15 to 17, 2018, so it even a day longer. Also, a lot of extra events and a larger knit night have been added. You can find all the information on the website. Mica and Jo, Edinburgh YarnfesT became one of the most popular events in the knitting world. What drove you to organize the Edinburgh Yarnfest in the first place? “The idea of EYF was born originally in 2012 with the aim to bring some of our favourite vendors of the UK knitting industry to Scotland. There was no such event up here in Scotland (and very few in the UK in general) and even yarn shops were few and far between. We felt left out. We yearned for a vibrant and colourful event like Knitnation in London 2011 (a one-off event). At that time knitting had already become much more than a hobby for us – we were obsessed! That’s what made us organize our first event in 2013. After EYF 2013 we realised that there was a much bigger desire for a highly specialised knitting event that we had thought. I Do love it. In addition to Friday and Saturday, EYF Will open on Thursday with only advanced tickets. What was the idea behind it? “It takes over a year to organise a show like this and even though things are quieter after EYF, it’s still a full-time job. Planning for 2019 has already started! So, thank you, Mica and Jo, for answering the questions. I really appreciate it as I know this must be the busiest time for you both. AND: Wow, this book is great news. I will definitely get hold of it as soon as you publish it. I love travelling Scotland and if I can add some yarny places to my itinerary, even better. I am really looking forward to EYF in March. All I need to do is book my flight tickets and set a budget for all the yarn I am going to buy. Anyway, for all the people who did not get advance tickets Edinburgh Yarnfest 2018 for Friday and Saturday, don’t worry. Just go to the Corn Exchange a bit later, maybe around noon or 1 pm. Take your time in the queue. Bring your project and knit and talk to all the fellow knitters waiting there to get in. Also, use your chance to make new knitting friends. It’s nice to get in touch – and there will be enough yarn for everybody. I had no advance tickets last year and it was not boring at all to queue. There is a Ravelry group for all things around EYF. Check it out here. Finally, are you spending a few more days in Scotland? Don’t miss New Lanark Mill. It is definitely worth a visit! There is yarn, too. It is an hour drive from Edinburgh. Do you want to knit with me at Edinburgh Yarnfest 2018? Get in touch via Ravelry or Instagram. I will be there on Thursday and Friday. I would love to meet some people I only know via the Internet.